Salt is the mineral sodium chloride, the only rock regularly consumed by humans. Salt enhances food flavor and helps to preserve food products. Most culinary salt is mined from underground salt deposits, crushed and mixed with potassium iodide and dextrose (sugar) to create the common iodized table salt. Sea salt is harvested from evaporated sea water. Red sea salt is a natural sea salt product from Hawaii that contains numerous healthy minerals. Many people are watching their salt intake for health reasons; the National Academies Institute of Health recommends no more than 2,300 mg of sodium per day for adults. However, some daily salt intake is necessary for optimum health. Colorado State University Extension states that under ideal conditions, we should consume no less than 1,500 mg of sodium per day, which is less than 1 tsp. of table salt. Sea salt actually has less salt in it than ordinary table salt. While table salt is nearly 100 percent sodium chloride, sea salt is about 81 percent sodium chloride and 19 percent other trace minerals, according to Hawaii Kai Corporation, an artisanal Hawaiian salt producer in Kaunakakai, Molokai, Hawaii. This means that 1 measure of Hawaiian red sea salt contains nearly one-fifth less sodium chloride than an equal measure of ordinary table salt, making it easier for people on a salt-conscious diet to meet their health requirements while still adding a pinch of flavorful salt to their favorite dishes. Alaea is the traditional red Hawaiian sea salt made from minimally processed Pacific sea water blended with a touch of Hawaiian red clay, according to the Salt Works, a Seattle, Washington-based gourmet salt merchant. Naturally processed, unrefined Hawaiian sea salt contains about 19 percent trace minerals and electrolytes, which are naturally occurring in the ocean, according to Hawaii Kai. These trace minerals are needed by the human body, according to Hawaiian Specialty Salt company, and they are enhanced by the addition of Alaea, which provides iron oxide to Hawaiian red sea salt. 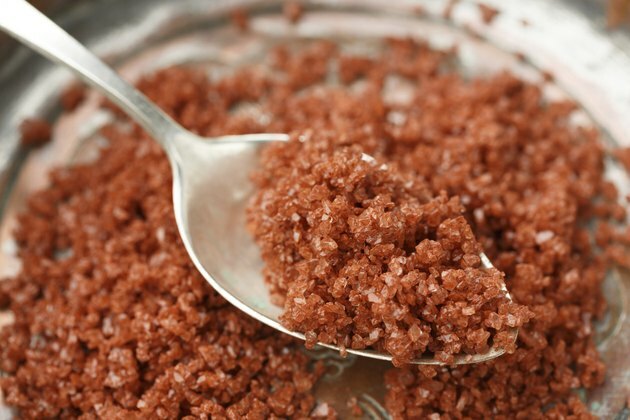 The iron oxide found in the red Hawaiian clay imparts this salt's distinctive color but also increases the healthful mineral content of red sea salt by adding a source of digestible dietary iron. The waters of Molokai Island are among the cleanest in the world, according to the Hawaii Kai Corporation. The rise in popularity of red sea salt has led to the revival of the traditional craft and business of salt making on this pristine Hawaiian island. In 2005, the State of Hawaii recognized the foundation of the Hawaiian salt makers guild, as Hawaii Kai reports. While some red sea salt makers, like Hawaiian Specialty Salt, use traditional evaporation methods, and others, like Hawaii Kai, use solar and reverse-osmosis technology, artisan salt makers provide a microeconomic business model that is environmentally sound, sustainable and consistent with local heritage and culture. This contributes to community economic and social health and ultimately to human health as a viable, nonpolluting secure food business. Is Soylent the Answer to a Healthy Diet?